A metalcut or metal engraving (the borderline between both techniques is a narrow one) are both forms of relief printing and are cut by hand on metal blocks. The choice of name depends on whether the result is more like a woodcut or a wood engraving. During the first hundred years of European printing, particularly in Germany in the late fifteenth century, craftsmen occasionally used metal instead of wood for relief prints. This form of metalcut is called the metalcut in dotted manner (see elsewhere on this blog). The first picture is a detail from a late fifteenth-century German metal cut, which show that the metal plate was mounted on a piece of wood. The head of one of the nails that held the plates on the wood can be seen above the halo. The difference between the engraved lines and the punched dots and patterns is obvious. 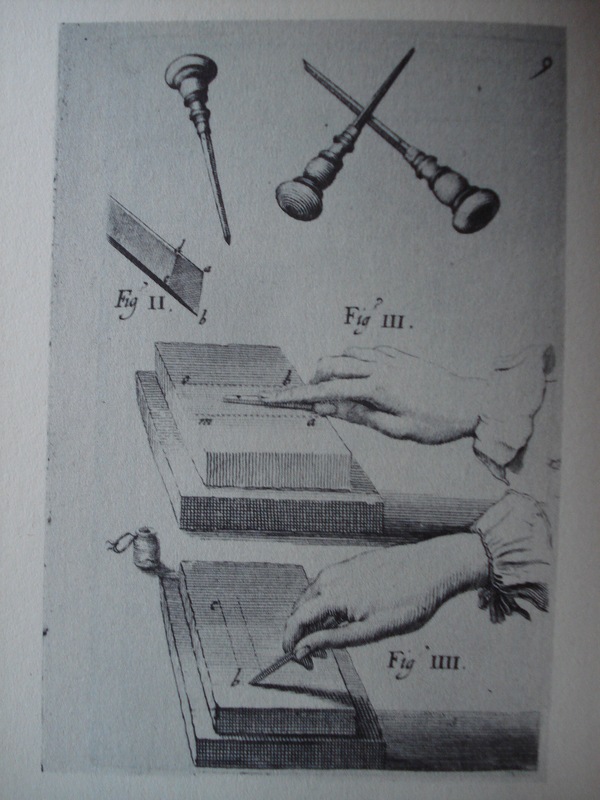 The second picture shows the tools, the cutting point and the method of sharpening it, by seventeenth-century burins or engravers. From the sixteenth to the eighteenth centuries relief vignettes would sometimes be cut in metal rather than wood. The metalcut looks, obviously, more like a woodcut, because the white areas in the cut are being gouged away with broad strokes. The metal engraving shows the fine white lines of the burin, just like in a wood engraving. However these kinds of prints are hard, if not possible, to distinguish from the cuts and engravings made in wood. 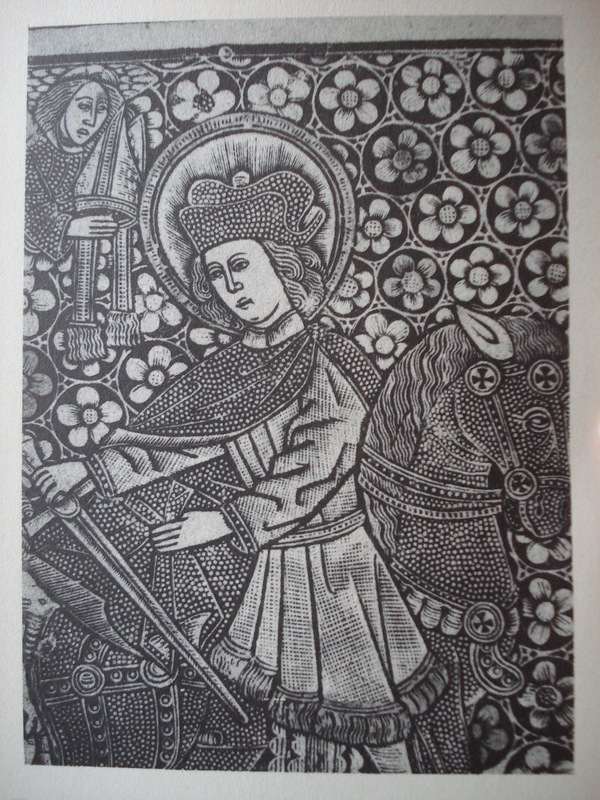 Another form of metalcut, aside from the mentioned dotted prints, is relief etching. This form of relief printing produces metal plates by etching away the negative parts of the subject, the design being drawn to the surface with a varnish that would resist the acid. William Blake (1757-1827), a British engraver who used the process, called it ‘woodcut on copper’. He also produced relief prints with the graver, which he called ‘woodcuts on pewter’. Gascoigne, B. How to Identify Prints. A complete guide to manual processes from woodcut to inkjet. Second edition. New York: Thames & Hudson 2004. Gilchrist, Alexander. Life of William Blake: with selections from his poems and other writings. In the series: Pre-Victorian book illustrations in Britain and Europe. Bristol: Thoemmes Press, Tokyo: Kinokuniya 1998. Hind, Arthur M. An introduction to a history of woodcut, with a detailed survey of work done in the fifteenth century. New York: Dover Publications 1963. Ivins jr., William M. How Prints Look. Photographs with a Commentary. Boston: Beacon Press 1943. You are currently browsing the metalcut category at PRINTING ILLUSTRATED.